It was the last in a series of several slides advertising Ortho Tri-Cyclen Low. There were others but it moved too fast for a good screen capture. Time-wasting link on the subject: The Museum of Menstruation. 2nd thought: Okay, it’s a little graphic for me. 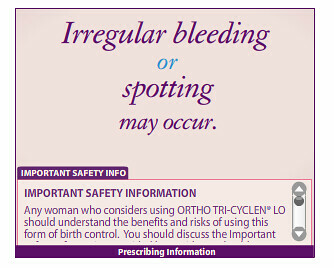 But it’s also kind of awesome that even in the age of free-for-all marketing of pharmaceuticals to consumers, companies are STILL required to list side effects in promotional materials. Remember the Lunesta commercials that had a serene CGI Luna moth bopping around against a pretty little lullaby? It was all mellow and stuff, but they were FORCED to end it with the voiceover dude listing like 2,000 wacky side effects, including my absolute favorite: sleep driving! Seriously, sleep driving? Okay, that’s about as much of writing about this as I can take. How about that weather, eh? 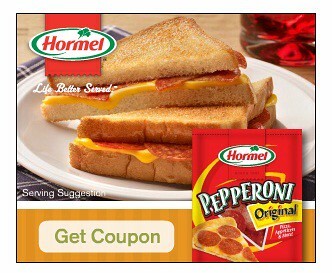 I got this web ad today on the Flickr network. Yes, that is PEPPERONI on a grilled cheese sandwich. I’ll let that sink in for a moment. I’ve spent enough time on a college campus to know that people sometimes combine dissimilar foods into bizarre chimera meals. Some of these things, like buffalo chicken pizza and Red Bull-based cocktails, have even gained legitimacy off campus. But does ANYONE really slap pepperoni on their grilled cheese sandwiches? Like, a real person? And before you say it, I know that grilled cheese has some elements in common with pizza (cheese, bread-type substance). But that doesn’t make it OK.
Well, I knew TAOPBGD would come full circle eventually. These two recently acquired boxes have designs we’ve seen before. What can we learn by giving them a studied second look? I first reviewed this Hot & Delicious design all the way back in the very first TAOPBGD post, and I still feel like that center chef is giving me the stink-eye. Side note: Do you think they depict pizzas as being in brick buildings to make you think of brick ovens, and therefore deliciousness? Or is it just a nostalgia inducing thing? Fresh Dough Daily Part II. 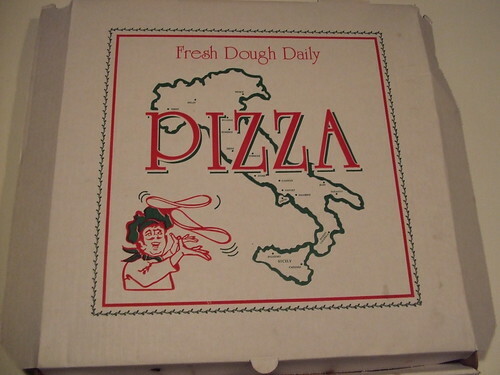 The first time I saw this design, it was on brown cardboard and the pizza in it was somewhat similar in taste and texture. This time, it had a white background and the pizza was pretty spectacular. Guess you can’t judge a pizza by its box. 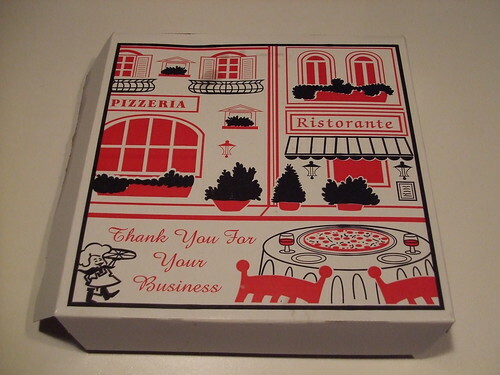 This charming little city scene pizza box comes from the equally-as-charmingly-named Picnic Pizza right off the NYS Thruway. I have to take a minute here to sing the praises of the slice that accompanied this box. It wasn’t one of those throw-a-bunch-of-arugula-on-it fake gourmet slices. It was straight up old world Italian, topped with sundried tomatoes and garlic, yo. Visual Assessment: They’ve got the traditional pizza box design colors (black and red) covered, but they’re taking a risk with depicting an exterior scene. 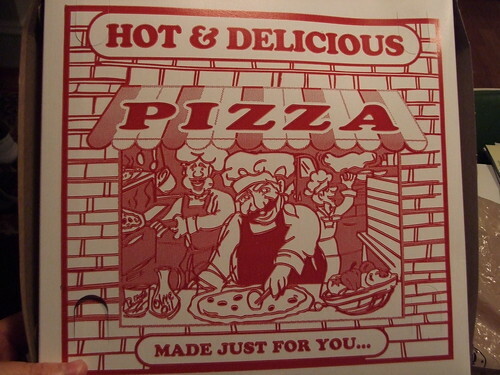 Think about it: have you ever seen a building or a car on a pizza box before? It’s usually jolly chefs behind counters, not traffic jams and skylines. But you can’t deny the INSANE cuteness of this street: the little shrubberies…the arched windows…the old-style exterior lanterns. And the best bit of all: the “Lady and the Tramp”-esque outdoor table with double wine glasses. Come on, you know it makes you smile. Generic Product Claim: Not exactly a claim, but it’s definitely generic: “Thank You For Your Business.” Actually, isn’t that usually just on receipts? Italian Stereotype: He may be small, but he’s there, trotting along with a bulbous chef’s hat, an over-sized mustache and what looks like (?) cowboy boots. Rating: Win. It may be unusual, but it’s still a classic box. Tiny Italian stereotype and all. It’s finally 2012, which means an obligatory end-of-the-year “best of” list. In my case, it’s more of a best-of-the-worst list. It’s also a great way to string a bunch of pictures I took of random weird marketing things together into a single, cohesive post. Let’s get to it! The award for the Most Dada-esque Design goes to…. 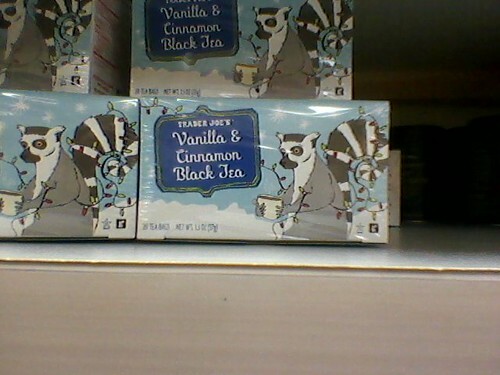 Trader Joe’s for their use of a cracked-out looking lemur on a box of black tea. Trader Joe’s packaging is usually pretty campy, but this is straight out of a surrealist art game. Why a lemur? Why does it look so cracked-out? The world may never know. 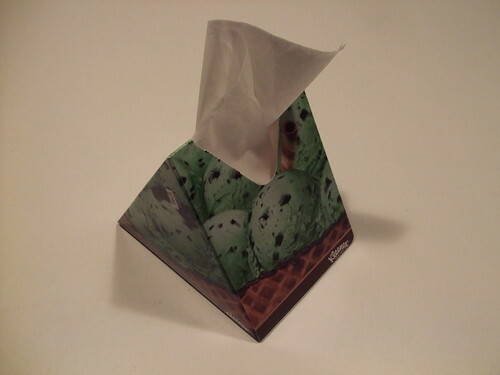 Kleenex for this box of tissues designed to…look like mint chocolate chip ice cream. In the episode of Mad Men that inspired this award, Conrad Hilton presents Don Draper with an ad by a competing agency for the Hilton hotels. The crappy ad features a cartoon mouse, which prompts Don Draper to quip, “No one wants to think about a mouse in a hotel.” Yeah well, no one wants to think about mint chip ice cream as they’re blowing away their boogers either, Kleenex. 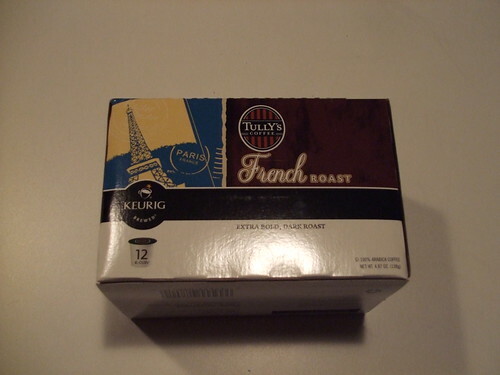 Tully’s Coffee, for this line on the package of their laziness-enabling Keurig cups: “..smoky flavors reminiscent of a quaint Parisian cafe. The sophisticated finish highlights the coffee’s sweet side and begs to be shared with a rich, chocolaty pastry.” Even though the only thing these coffee cups will ever be paired with is an office donut, extra points go to the frustrated copywriter for the effective use of unnecessary creativity. 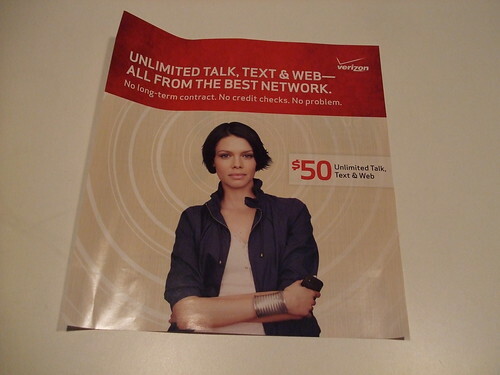 Verizon, for this ad that looks a little bit like the promos for that The Girl with the Dragon Tattoo movie. I think it’s also supposed to appeal to savvy, tough women customers. ‘Cuz she’s not a blonde! And she’s got her arms crossed! Friendly’s, of course. 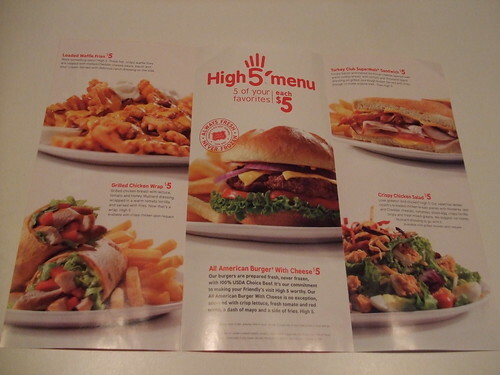 This flyer for the $5 menu is something that can only be understood by people who appreciate a good game of peek-a-boo. Each section describes a meal from their $5 menu, then ends with “high-5.” Example: The Turkey Club SuperMelt is “…warm turkey breast with tomato and Thousand Island dressing on a grilled sourdough bread. Served with fries. Enough to make anyone melt. Then High 5.” The Grilled Chicken Wrap is “…wrapped in a warm tomato tortilla and served with fries. Now that’s a wrap. High 5.” Get it? Repetition is FUNNY (you know, for toddlers and stoners). 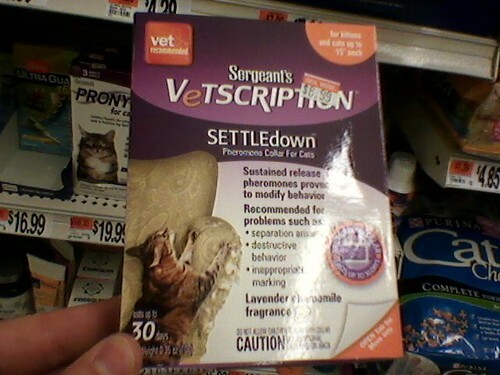 Sergeant’s Vetscription for accurately depicting the downsides of pet cohabitation on the box for the “SETTLEdown pheremone collar for cats.” I love my cats and won’t subject them to some bizarro cat hormone collar. But the picture definitely nails the crazy-eye face they make when they’re about to destroy something sentimental or expensive. 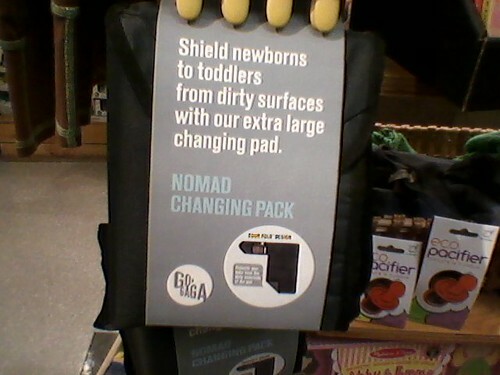 Nomad, for believing that changing pads are primarily for “shielding” your newborn babe from the filth of the outside world. Not, you know, to protect the surface from BABY POOP. That’s a wrap for 2011!